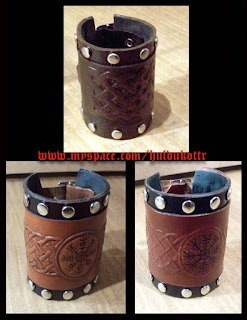 Those are the first bracers we did following this double leather pattern. We were bored of one piece typical bracers, black dyed with nailheads, then we did those ones mixing nails with tooled leather in a viking way. The really first ones were the couple below, those with the Aegishjalmr (Helm of Awe). The Aegishjalmr was a Bindrune, usually carried between the eyes or in a helmet, confering an awful panic on the bearer's enemies. It is said that Aegishjalm is the lost Odin's eye, some kind of a "third eye" able to mesmerize a foe in all cases. It is also called "The eye of Fafner" as it results reading the Völsunga saga and Niebelung myths. By the way, the bracer in the up side of the picture was another comission for a girl, she wanted a simple black version with a celtic knot, but we arrange to include it in the final pic.